Imagine you’re walking by a field. The grass is ripped up from the cleats of energetic athletes holding sticks between their legs, trying to throw a volleyball into one of three hoops — congratulations! You’ve found yourself a game of Quidditch. To break the sport down, there are seven players on each team: one keeper, one seeker, two beaters and three chasers. The object of the game is to score the most points by throwing a quaffle, which is really a volleyball, into one of the three hoops. The keeper and the chasers are the only ones who have the potential to score. The basis of Quidditch sounds pretty simple, right? But there is much more to it. The keeper acts as a goalie and guards the hoops so you can’t score. Additional defenders are the beaters who throw bludgers, which are dodgeballs, at the opposing team. When hit with a bludger, the player, after saying “Ouch,” takes their broom from between their legs and runs back to touch their team’s hoops. This action repeats throughout the entire game as each team gains control of the quaffle. Now, onto the most asked about position, the seeker. I think that people get the most excited about it because they remember that Harry Potter was the seeker, or they want to know how we got our hands on the magical gold ball. Well, sorry to break it to you, but the position is not as glorious as it seems. There is no flying ball and, as you should know, we don’t fly either. But hey, don’t get too disappointed. The snitch is a player in gold shorts that runs around the field, and it’s very enjoyable to watch. The seeker tries to catch, and possibly tackle, the snitch and grab the ball that’s hanging off the back of the shorts. Watching it puts you on edge, as the rest of the game goes on behind it. Once the snitch is caught, that team is awarded 30 points, and the game ends. Like most sports, the team with the most points wins. I get it. It looks weird and it’s definitely not the first thing that comes to mind when you think of sports. We’re labeled as Harry Potter geeks and people passing by shout “10 points to Gryffindor!” There’s ridicule and judgment from others, but the key is that we have fun and no shame. 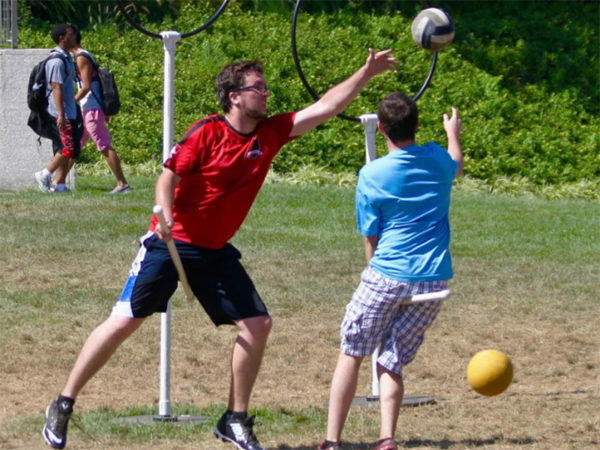 When I first set foot on the Stony Brook campus, I already had my eyes set on joining the Quidditch team. Originally, I felt this corresponded with my dorky composure and obsession with Harry Potter, but there is so much more to the sport. First of all, not everyone who plays loves the magical wizarding world it originated from. Most people haven’t even read all of the books. Although there are many different aspects to Quidditch, you don’t have to be at the level of a professional athlete to play and enjoy yourself. Within a few practices, you begin to understand the point of the game and slowly work on becoming a dominating player on the field. One of my favorite things about Quidditch is its gender inclusivity. Quidditch is open to everyone, including people who don’t identify with the gender binary. There is a rule where, for each team, there cannot be more than four people of the same gender on the field at once, excluding the seeker. Being on the Quidditch team puts me in a relaxing and accepting environment. When I’m not playing Quidditch, I’m overwhelmed and my work is constantly on my mind. Once I step onto the field, it’s as if I hit the pause button and my focus changes to something fun for the two-hour practice. With schoolwork, you are on your own, but with a sport, you have other people to help you and to rely on. The aspect of working as a team toward a common goal has allowed me to form close bonds with my teammates, and they have become some of my best friends. Being involved in a challenging sport brings out a new side of me. I work hard and sometimes, when I don’t score or I lose the ball to the other team, I get frustrated and emotional. Having my teammates there helps me calm down, and they tell me to not be so hard on myself. They are my friends but on a whole new level. They are the ones who pick me up, dust me off and get me through my frustrations. People think Quidditch is odd and are discouraged because of that. I feel that just because something is different doesn’t mean you shouldn’t try it. I never thought that I would be this invested in the Quidditch team, but it’s become one of my favorite things to do. It brings me happiness in a stressful environment, and I’m sure it can do the same for many others.